Full correspondence with BBC listed here. On 18 December 2014 I received the BBC Trust’s decision that it would not hear my complaint regarding ‘Saving Syria’s Children’. This represents the final stage in the BBC complaints procedure. The decision was taken at the 6 November 2014 meeting of the Trust’s Editorial Standards Committee (ESC) and ratified at its December meeting. It was published on the BBC website on 20 January 2015 in the October – November 2014 edition of the ESC’s appeals findings report (pp 134 – 159). Below is an annotated copy of the decision with a number of weblinks which may help in assessing the adequacy of the ESC’s responses. A lack of annotation in any part does not indicate agreement. Note too that further evidence points have continued to come to light following the ESC’s decision. For an overview of all the evidence in this matter see here. A final appeal by another complainant was rejected at the ESC’s January 2015 meeting and its decision published on 26 February 2015. The complainant asked the Editorial Standards Committee to review the decision of the Trust Unit that the complainant’s appeal did not qualify to proceed for consideration by the Committee. The complainant alleged that sequences depicting the aftermath of the incendiary bomb attack contained “a large degree of fabrication”. The two news reports included in the appeal were items about the incendiary attack; they both used material shot by the Panorama team, most of which also appeared in the documentary. In its response at Stage 2, the Editorial Complaints Unit (ECU) advised it was incorporating into one response the allegations concerning the reports which appeared on the Ten O’Clock News and the allegations about Panorama. The same approach was adopted for this decision. None of the issues raised by the complainant were upheld at Stage 1 or Stage 2. The complainant appealed to the BBC Trust on 11 June 2014. The complainant considered that the BBC had made the supremely serious allegation that the Syrian government had deliberately targeted schoolchildren with an incendiary device, yet had at no point requested or published a response from the Syrian government as required by section 6.4.25 of the BBC Editorial Guidelines and section 7.11 of the Ofcom Broadcasting Code. The complainant considered that ‘Saving Syria’s Children’ misled audiences in a number of ways and the programme breached the BBC Editorial Guidelines in the misleading chronology presented in its first half, the editing out of all chronology of the scenes of the “napalm bomb” “victims” from 30:38 onwards and, above all, in the staging of an atrocity. The complainant presented a number of points to support his view that the programme misled audiences. He argued that there were discrepancies between the Panorama programme and third party content. The discrepancies he highlighted related to, but were not limited to, the casualty figures, the date and time of the attack, images and details of victims. The complainant considered that the inconsistencies suggested that the incident had been fabricated. This paragraph is a loose roundup of concerns I have expressed throughout my correspondence with the BBC and does not represent the contents of my 11 June 2014 appeal which focused narrowly on a number of specific points. An audio edit of an interview with a doctor was misleading. The nature and severity of the injuries of some of the victims seemed to be fabricated. The location of the attack appeared to be a private home and not a school, which suggested the incident had been fabricated. The affiliations between one of the doctors, the charity featured on the programme, and the Syrian Opposition Movement were not scrutinized. Of the five bulleted points above, only the fourth was included in my 11 June appeal. I had last raised the point regarding the school on 17 March 2014. The complainant asked the Trust to review the decision of the ECU not to uphold his appeal. He also asked for points he had raised in previous correspondence to be considered and included some additional information to support those points. The relevant correspondence was reviewed by the Trust Unit. The Senior Editorial Strategy Adviser (the Adviser) watched the relevant programme and news reports. An Independent Editorial Adviser (IEA) also reviewed the relevant output, read the correspondence and carried out further research. The Adviser considered that the appeal did not have a reasonable prospect of success following: analysis of the arguments raised by the complainant; consideration of the IEA’s research; and a review of the explanations provided to the complainant by the BBC at earlier stages in the complaints process. A brief summary of the reasons for the Adviser’s decision is set out below. The Adviser noted paragraph 1.5 of the Editorial complaints and appeals procedure, and noted that fairness complaints can only be made by a first party complainant, or by someone who has the authority to represent them. The Adviser considered that, as the complainant did not have authority to complain on behalf of the Syrian Government, he could not bring a complaint about the fairness of not offering the Syrian Government a right of reply. The Adviser noted the detailed investigations carried out by BBC Complaints at Stage 1 and the ECU at Stage 2 and their respective reasoning for rejection of the complaint. The Adviser noted the ECU had viewed all of the rushes of the incident filmed by the Panorama team in considering its decision at Stage 2. The Adviser reviewed the allegations and responses; additional questions were put to the ECU about the nature and content of the rushes prior to the Adviser reaching her decision. The Adviser considered each of the complainant’s accuracy allegations in turn over the course of approximately 14 pages of her letter to the complainant. Her responses are set out in full in the Annex. She considered that there was no reasonable prospect of concluding that any of the matters raised by the complainant would be upheld as breaches of the editorial guidelines. In particular, the Adviser was of the view that the complainant had not raised sufficient evidence to support his allegation that the footage broadcast by Panorama had been fabricated. The Adviser further noted that the cameraman and the reporter were both BBC employees, with considerable experience in the region and in war reporting. She noted that the ECU had spoken at length to the reporter and was confident that he had no reason to doubt that what he was witnessing was the aftermath of a genuine and horrific incident. The Adviser noted also that the material was filmed in a conflict zone. The degree of sophistication that would be required to have staged an incident such as this for the benefit of the cameras, and to have deceived such an experienced team, would, in the Adviser’s view, likely have been impossible on the frontline of an ongoing conflict. 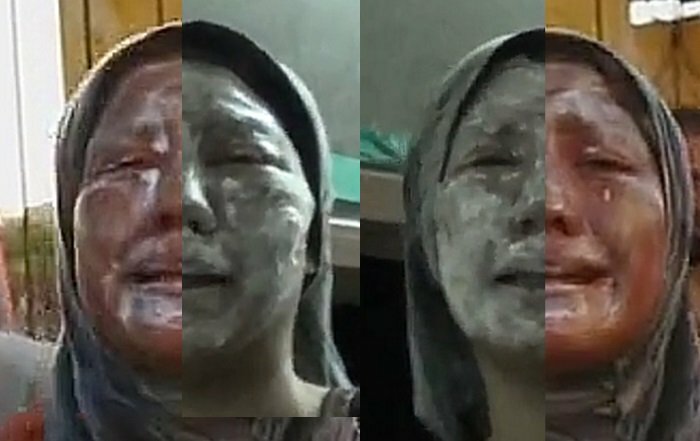 An August 2014 Newsnight report by Dr Saleyha Ahsan demonstrated “HOSPEX” medical simulation techniques. Such techniques could feasibly account for the alleged injuries presented in ‘Saving Syria’s Children’. There is a direct personal link between Dr Ahsan and the officer in charge of the HOSPEX exercise shown in the Newsnight report (“he was my squadron commander in Bosnia and inspired me to study medicine”). I have not contended that the Panorama team was deceived. Therefore, the Adviser believed Trustees would be likely to agree with the ECU’s conclusion that there was no substantive evidence of fabrication, and overwhelming evidence to the contrary that what the Panorama team had witnessed was genuine. She therefore did not consider the appeal had a realistic prospect of success and did not propose to put it before Trustees. The complainant wrote to the BBC Trust on 2 September 2014 following the decision by the Adviser that none of the issues he had raised qualified to be heard on appeal and that his complaint would not therefore be put in front of Trustees. “In the first instance, I believe that a major procedural error and a number of other serious oversights and mistakes have been made by the Adviser. His appeal had been misinterpreted; he had asked for a review of the ECU’s decision but instead the Adviser had considered only the subsidiary points he had raised in his letter of appeal; the Adviser had disregarded a supplementary submission to the complainant’s original appeal. The complainant had new evidence “identifying a possible participant in the napalm bomb event”; the complainant asserted that she appeared to be Dutch and he could find no explanation as to why she would have been in Aleppo. A team of local investigators in and around Urm Al-Kubra could not find anyone who was aware of a “napalm bomb” in the town last August. It was clear that the “alleged eyewitness” who was shown appealing to the UN was reading from a cue card. The “Iqraa Institute” had been identified elsewhere in the media as the location for the “alleged” bomb and from the complainant’s inquiries Iqra schools were generally proselytising Islamic educational centres. But the images of the “school” and the demeanour and dress of the headmaster interviewed by the BBC, along with the fact that girls appeared to be being taught alongside boys was not consistent with how such a school would be set up. 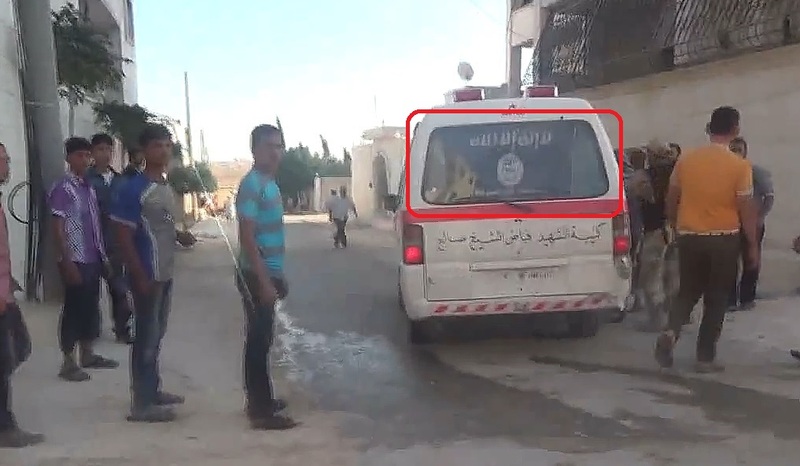 Also from his investigation there were no Iqra schools in Aleppo province. BBC Worldwide had been blocking YouTube copies of the Panorama programme. There was fresh uncertainty about images of a victim taken from a photojournalism website. Nobody from the Trust Unit had viewed the rushes, but had relied on the ECU’s interpretation and its claims regarding the rushes were “notably weak”. A reference to summer 2012 in the Adviser’s report should have been 2013. The complainant did not assert the Panorama team had been deceived, rather he believed they had been complicit (in fabricating the event). Questions remained as to the chronology and location of events. A number of retrospectives broadcast on the BBC in August 2014 contained factual inaccuracies which cast doubt on the BBC’s editorial standards. This refers to a) an observation that the background in some scenes in this brief item have been blurred and b) the re-editing of the 29 August 2014 edition of Newsnight. On 15 September 2014, the complainant sent a further submission. He sought additional information about the interview conducted with an eyewitness in the report and raised further questions about the footage of an injured baby and the burns apparently sustained by another child in the footage My point was about the baby only. He stated that some of those identified in the report were, according to the “Digital Registry of the Syrian Civilian Status Service” in Damascus, still alive. He considered that there were discrepancies in the responses he had been sent by the BBC at Stage 1 and Stage 2 This seems to be a further reference to my concerns regarding the interview with Mohammed Abdullatif. This section refers to the Adviser’s decision of 26 September 2014. My understanding is that this should have represented the final stage in the BBC complaints process (see section 5.11); however this decision contained an invitation to request a further review by the Trustees. (The 1,000 word limit for “final” requests for review was not demanded in either instance). The Adviser reviewed and fully considered the points raised in the complainant’s challenge of 2 September 2014 and the complainant’s further submission of 15 September 2014. In particular, the Adviser considered first the assertion that she had misinterpreted the complainant’s appeal and as a consequence had based her decision only on a number of supplementary points he had raised in his appeal and had not conducted a review of the ECU’s decision as he had requested. She confirmed that her decision had considered the range of issues also considered by the ECU at Stage 2. In particular she noted the nine substantive points highlighted in her decision relating to the Accuracy guideline, each of which included a detailed discussion of both the allegation and of her reasoning why on each occasion the allegation did not qualify to proceed to appeal. The Adviser noted that she was not normally able to consider new evidence or new allegations subsequent to her decision, such as the “identification” of a new “participant”, the alleged blocking by the BBC of YouTube content, and allegations concerning content which had not previously been included in the complaint and which post-dated Stages 1 and 2 of the complaint. The Adviser did not agree with the complainant that he had demonstrated why exceptionally on this occasion, this new material required to be considered. By way of guidance the Adviser noted, however, that even had the new material been admissible she did not consider any of the new points raised would have had a bearing on her decision. The Adviser noted also the complainant’s clarification, in his challenge to her decision not to proceed, alleging that the Panorama team had not been duped, but had in fact been a party to the fabrication of the event. She considered this was among the most serious allegations a programme maker could face. interviewed and corresponded with a representative from Human Rights Watch. The IEA’s conclusion, taking into account this evidence, was that the incident depicted in Panorama took place as described and that the presentation of the victims’ injuries and the outcome were wholly consistent with what would be expected following an incendiary bomb attack of this nature. The Adviser reviewed the authoritative body of evidence substantiating the Panorama programme and concluded that were this complaint to proceed to appeal, Trustees would not be likely to uphold the allegation. She therefore did not consider the appeal had a reasonable prospect of success and did not propose to put it before Trustees. A team of local Syrian investigators had contacted a former Commander in the Free Syrian Army who had stated that the “napalm bomb” “story” was false; the former Commander was willing to provide a full statement subject to appropriate assurances that his identity would be protected. The lead Syrian investigator had spoken to an “emissary”. This emissary had interviewed a resident of Urm Al-Kubra and the resident had been astonished at reports of an attack, which he would have heard about if it had actually occurred. The BBC had failed to investigate further the apparent appearance of a Dutch woman in footage shot at Urm Al-Kubra which had been brought to its attention in the complainant’s earlier challenge. Each individual interview with a doctor had breached the editorial guidelines on accuracy. The variant versions of a section of interview with a doctor in different news reports fundamentally undermined the necessary trust that audiences should be able to repose in BBC news reports; neither the ECU nor the Adviser appeared to have considered the likely effect on the audience of being presented with the same interview on different occasions, but with the words “chemical weapons” substituted for “napalm”. Re: this and the previous bullet point see section The editing of Dr Rola Hallam’s words: due accuracy and compliance (paras 1 – 34). 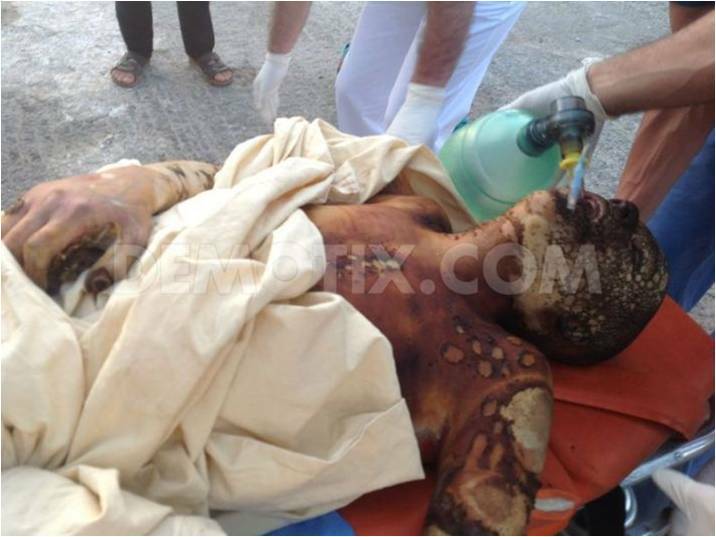 Video footage which appeared on the Ten O’Clock News on 29 August 2013 showed a boy near a truck outside the hospital “looking into the camera and grinning broadly”; the complainant asked what possible reason someone who had just been sprayed with a “napalm-like substance” might have for amusement. The Trust should consider requesting the metadata from Panorama’s footage in order to resolve the discrepancies in the reported time of the attack. a submission from lawyers representing the owners of a cable and satellite broadcast channel that expressed, amongst other matters, an interest in the outcome of the appeal. The incendiary bomb attack did not happen and the BBC Panorama team was complicit in fabricating footage. There were a number of matters that required investigation and would provide further support to the view that the incendiary bomb attack did not occur. The editing of an interview with a doctor in the Panorama programme and the BBC Ten O’Clock News segments breached the guidelines on accuracy. The different versions of interviews with a doctor taken as a whole misled audiences and undermined the audience’s trust in the content. There was evidence of links between the Syrian opposition and the charity and the doctor featured on the programme and viewers should have been informed of this. There were a number of additional factors that raised concerns about BBC content or the complaints procedure in general. The Trust will only consider an appeal if it raises “a matter of substance”. This will ordinarily mean that in the opinion of the Trust there is a reasonable prospect that the appeal will be upheld as amounting to a breach of the Editorial Guidelines. In deciding whether an appeal raises a matter of substance, the Trust may consider (in fairness to the interests of all licence fee payers in general) whether it is appropriate, proportionate and cost-effective to consider the appeal. The Committee took each issue in turn. The complainant considered that the incendiary bomb attack did not happen and the BBC Panorama team was complicit in fabricating footage. Local Syrian investigators had questioned the authenticity of the list of victims of the incident. A Dutch Armenian woman appeared to have “participated” and “fraudulently performed” the role of a victim in the “napalm bomb event”. An unnamed practising medical doctor had offered his view that the footage of injuries had been fabricated, based on a review of the behaviour of the patients, footage of their injuries and the treatment offered to them. See section Plausibility of injuries and demeanour of alleged victims Note that the consultant plastic surgeon asked by the Trust to review the footage is also unnamed. (The doctor I quote is in fact female). Two women in the Panorama footage were both wearing the same “distinctive dress with gold flower design and blue headscarf”. This suggested that they were amateur actors who had shared the same costume. The second, younger woman did not feature in Panorama but in non-BBC footage from the incident (Update 2018: a reader of this blog has demonstrated to my satisfaction that I was mistaken in my belief that the woman featured in Panorama is a different person to that featured in YouTube footage of the events of 26 August 2013). The Syrian investigation team had informed the complainant that there were no Iqra schools in the Aleppo province. In fact the investigation team had noted that Iqra “schools” do occur in Aleppo province: they are informal, occasional gatherings set up by local opposition councils and led by clerics for the religious indoctrination of primarily adult males; further information gleaned by the team confirmed the religious nature of the institution referred to in ‘Saving Syria’s Children’ (named by Dr Ahsan as the Iqraa Institute) and indicated that older children were required to attend by their families out of fear of being perceived as disloyal to the opposition. The interview with an eyewitness on the Panorama programme suggested that he was reading from text or a cue card. This eyewitness was listed by the Violations Documentation Center as a 15-year-old who was killed in the incident. This was not presented as a “key point”, rather as a curious, if suggestive, aside. The BBC had broadcast two different versions of an interview with a doctor which had undermined confidence in the authenticity of the programmes. See section The editing of Dr Rola Hallam’s words: due accuracy and compliance (paras 1 – 34). Footage in the programme had not been shown in chronological order, which raised questions about the authenticity of the programme. Note sections Misleading and manipulative editing and Sequencing of events in Panorama. There were discrepancies in reports regarding the timing of the attack between the statements made by a Panorama journalist, Human Rights Watch and the Violation Documentation Center in Syria. Some of the footage in the Panorama report suggested that the report was faked or choreographed e.g. the footage of men in pain at the hospital was a scene of “amateur dramatics”. Images from a photojournalism website appeared to come from a different hospital than that which was shown on Panorama, yet they showed some of the same victims as had appeared in Panorama. The images in question, from the website Demotix, were originally dated 25 August 2013, i.e. the day before the events depicted in Panorama. When the images were dated incorrectly, Ian Pannell denied that they featured victims who had been shown in his report; after Demotix amended the date of the images to 26 August, the BBC acknowledged that the victims featured in them did indeed also appear in Panorama. See here. Third party reports and content on the incident conflicted with the BBC’s account and the Panorama footage. Notable examples are Dr Saleyha Ahsan’s 27 November 2013 account on Australian radio, which is entirely irreconcilable with the events depicted in ‘Saving Syria’s Children’ (see Conflicting accounts of first victims) and the widely varying accounts of the time at which the attack occured. o in the final edit, Panorama had been deploying a standard montage device to give the viewer a flavour of what they were about to see. She did not consider that the use of the device which on occasion depicted scenes out of strict chronological sequence would have misled the audience in any way Note sections Misleading and manipulative editing and Sequencing of events in Panorama. 3. The charity, Human Rights Watch (HRW), independently documented the attack as part of a wider investigation into Syria’s use of incendiary weapons. Human Rights Watch states that it has “not investigated this incident“. As noted here, a November 2013 Human Rights Watch report (cited by the Trust Unit on 26 September 2014) reports the time of the alleged attack as “around midday”; in the same paragraph HRW cites a report by the Violations Documentation Center in Syria (a frequent BBC source) which puts the time of the attack squarely at 2.00pm and quotes an activist who claims he heard “rumours” of the attack “At 3 in the afternoon”. Ian Pannell states categorically that the alleged attack happened “at around 5.30pm at the end of the school day”. Pannell’s colleague, ‘Saving Syria’s Children’ cameraman, director and producer Darren Conway, appears to claim that victims began arriving at Atareb Hospital, some distance away from the site of the alleged bomb, “between 3 and 5”. 4. Correspondence between HRW and the IEA indicated that individuals at HRW had no doubts as to the authenticity of the images – either relating to the bomb fragments and debris or of the victims’ injuries. 5. The IEA interviewed and corresponded with an independent journalist. The independent journalist had written an article for an American news website describing the bombing of Urm Al–Kubra and he had spoken to a father of one of the victims. See section Freelance journalist, Paul Adrian Raymond. 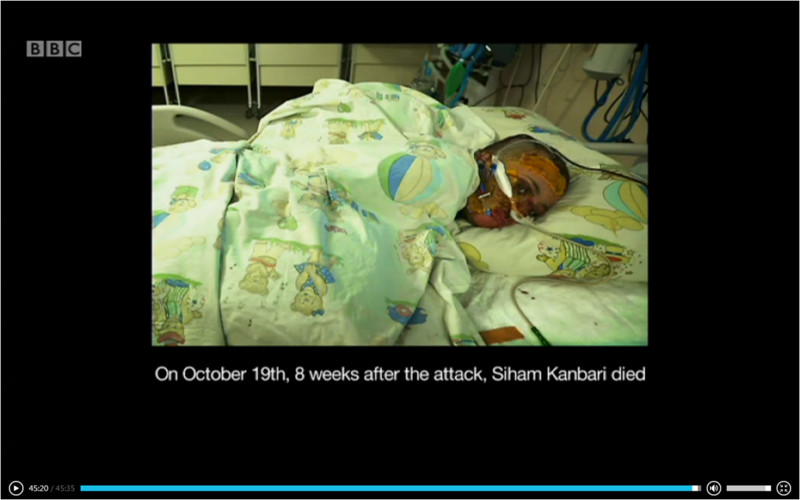 Raymond states that Siham Kanbari (Qambari) died “seven weeks” after the attack, which read strictly would indicate Monday 14 October. Dr Ahsan has stated that Siham died on 20 October. An update to the end credits of Saving Syria’s Children claims that Siham died on 19 October. o the serious outcomes in many cases were entirely consistent with how burns injuries invariably present. 7. The IEA posed a series of questions to the Panorama team. The Panorama team indicated that their visit to the hospital was not planned or part of a scheduled itinerary. 8. A member of the Panorama team considered that the discrepancies between the victims discussed on the programme and the Syrian government’s database could be explained. He considered that it was unrealistic to imagine that the Syrian government was capable of maintaining such a database in the middle of violent civil war and in light of the fact that the Syrian government had not had any representatives in the areas where the victims lived for at least two years. The Committee weighed the arguments presented by the complainant against the details presented by the Trust’s Adviser, investigation carried out by an IEA, analysis of the footage by a consultant plastic surgeon, Human Rights Watch’s independent investigation, and reports by other independent organisations and individuals. Re: HRW’s “independent investigation” see fifth bullet immediately below. the Adviser’s initial letter (see Annex for an extract) and the Adviser’s second letter to the complainant both provided comprehensive and convincing rebuttals to the complainant’s allegations. the rushes did not appear to provide any support for the allegation that the footage was fabricated and in fact supported the programme makers’ narrative of events in that there was no indication that journalists were “directing” action or influencing events. the Panorama team had provided credible and verifiable information about the commissioning process and about their movements in Syria and Turkey which would suggest that a conspiracy of the nature alleged by the complainant could not have taken place. the detailed independent investigations by others, including Human Rights Watch and the United Nations, provided further support that there had been an incendiary bomb attack broadly as Panorama had reported. As noted above, Human Rights Watch clearly states that it has “not investigated this incident“. On 16 September 2013 Paulo Pinheiro, Chairman of the United Nations’ International Commission of Inquiry for Syria, briefly referred to the alleged incident in Urm Al-Kubra at this “panel investigation”, giving the source of the Commission’s information as the testimony of “survivors”. The Commission’s 12 February 2014 report also mentions the alleged attack (pp 14 & 19). The report notes (p4) that it “relied primarily on first-hand accounts”, that the information presented is based on “interviews conducted in the region and from Geneva” and that “The standard of proof is met when the commission has reasonable grounds to believe that incidents occurred as described”. The Committee were satisfied that this aspect of the complainant’s complaint did not raise a matter of substance because there was no reasonable prospect of concluding that the Panorama team fabricated footage of an incendiary bomb attack. The Committee considered that if it took this matter on appeal it would be likely to conclude that the content had achieved due accuracy. The Committee noted that the complainant had raised a number of additional matters that could not have been fully assessed without substantial further investigation. It had in mind in particular the suggestions that an unnamed former Commander from the Free Syrian Army had denied the incident took place, that a Dutch woman had “participated” in the “scenes” as an actress; and that metadata from the Panorama team’s footage should be analysed to resolve discrepancies in the reported time of the bombing. The Committee also noted that the Commander from the Free Syrian Army was claimed to have invited BBC journalists to Turkey, where he would be willing to provide “safe transit to Urm Al-Kubra where the BBC [could] conduct an investigation and speak to witnesses assembled by the Syrian team”. In light of the Committee’s view that there was compelling evidence that the incident happened broadly as depicted in Panorama and the associated Ten O’clock News reports, the Committee decided that it would not be appropriate, proportionate or cost effective to conduct an investigation into these additional matters. The Committee therefore concluded that this aspect of the complainant’s complaint did not raise a matter of substance and had no reasonable prospect of success. the different versions of an interview with a doctor, taken together and considered in the round, undermined audiences’ trust in BBC content. These matters are discussed in section The editing of Dr Rola Hallam’s words: due accuracy and compliance (paras 1 – 34). Doctor: I need a pause ’cos it’s just absolute chaos and carnage here…umm…we’ve had a massive influx of what look like serious burns… Er… it seems like it must be some sort of… not really sure, maybe napalm, something similar to that. The Committee noted that the different internal edits were not signposted to audiences by the use of a visual cut-away because the doctor was wearing a medical face mask throughout the interview, making a visual edit unnecessary. The Committee noted that cut-aways were a visual production technique to ensure the action flowed freely and that the absence of any visual editing on this occasion was not likely to have misled the audience. It was considered that the programme team had taken the opportunity afforded by the medical face mask to treat the audio as it would a radio clip, and in doing so had improved the flow of the action; the choice not to use a cut-away had no impact on the meaning of the doctor’s contribution. Turning to the audio edits, the Committee did not consider there was any material difference between the two broadcast versions in terms of the information which was being communicated: it was a legitimate editorial decision by producers on one occasion to select one part of the doctor’s answer and on another a different part. Trustees considered that it was normal custom and practice when the same interview was used in different output and the producers had access to the rushes and that it did not suggest any intention to mislead. The test was whether each version of the interview, in its context, was duly accurate, and Trustees concluded that it was. They noted too that the audio came from within the same sentence of the doctor’s original contribution and was therefore used in the original context. Trustees considered that the BBC had not changed the words used by the doctor and in light of the reasoning provided above, the Committee considered that it was unlikely to conclude that the requirement for due accuracy was breached by interviews that were broadcast. The Committee considered that the use of the production technique was in line with editorial guideline 3.4.16 because the audience was not materially misled as to the nature of the doctor’s contribution or the events. Finally in relation to each individual edit of the interview in the three programmes, Trustees noted that there was no evidence that would lead to the conclusion that the BBC “knowingly and materially” misled audiences in breach of guideline 3.2.3. The Committee therefore decided that there was no reasonable prospect of concluding that the editing of the interviews with a doctor in the Panorama programme and the news report breached the editorial guidelines on accuracy. Trustees noted that audiences viewing the three programmes would have been given a similar impression of the events that took place in Northern Syria, namely that an incendiary weapon, similar to napalm but not chemical, had been used. Taking the interviews as a whole, Trustees could also see no evidence that would lead to the conclusion that the BBC “knowingly and materially” misled audiences or that the edited interviews, taken as a whole, materially misled audiences about the reality of the narrative or events in breach of guideline 3.4.16. The Committee also considered that the interviews, whether viewed separately or as a whole, did not undermine audiences’ trust in BBC content. Trustees also noted that elsewhere in the Panorama programme and in the two news bulletins, additional information was provided about what was known about the nature of the attack, such that the audience would not be relying solely on this one contribution from the doctor for their information in that regard. Trustees considered that this was an important distinguishing factor from the hypothetical scenario used by the complainant to support his arguments. Therefore, it was considered that it was unlikely that audiences would draw the conclusion that there was an intention to mislead or to distort the interview, even if the three relevant programmes had been viewed side by side. The Committee therefore concluded that taking the interviews either separately or as a whole, there was no reasonable prospect of concluding that the interviews had undermined audiences’ trust in BBC content or breached the editorial guidelines on accuracy. the links between the doctor’s father and the Syrian opposition. See section Dr Rola Hallam and Hand in Hand for Syria, Dr Hallam’s 30 August 2013 Newsnight appearance and section 5 of this 29 December 2014 appeal to the BBC Trust. (This appeal also contains observations regarding the impartiality and integrity of Dr Hallam’s colleague, Dr Saleyha Ahsan). commentary in the programme explained the context in which the filming was taking place, namely that the team could film only in rebel-held areas and that sectarian differences and extremism had taken hold on both sides after three years of war. Trustees considered that there was no evidence to suggest that the audience had been misled about the doctor or the charity. The Committee agreed with the Adviser that were this allegation to proceed to appeal it was unlikely that Trustees would conclude that there had been a breach of the editorial guidelines. Trustees noted that the complainant raised a number of further matters which did not raise a matter of substance or have a reasonable prospect of being upheld as a breach of the editorial guidelines. The Committee noted the matters detailed below in particular. The complainant considered that the Panorama programme had failed to provide a right of reply to the Syrian Government. It was noted that this was a fairness complaint. The Committee noted that paragraph 1.5 of the Editorial complaints and appeals procedure states that fairness complaints can be made only by a first party complainant or by someone who has the authority to represent them. The Committee noted that there was no indication to suggest that the complainant was authorised to represent the Syrian government and therefore considered that he could not bring this complaint. The complainant considered that BBC Worldwide had blocked YouTube copies of ‘Saving Syria’s Children’ at a faster pace than other more recent Panorama programmes. The Committee noted that this was an operational matter for BBC Worldwide and was not relevant to determining whether BBC content had breached the editorial guidelines. See this assessment made on 2 August 2014, plus updates of 28 August and 24 December 2014. The matter is summarised at section 8 in this 29 December 2014 appeal to the BBC Trust. The complainant noted that BBC Audience Services had rejected another individual’s complaint about the programme because it was out of time; the complainant requested that complaint be considered alongside his own. Trustees considered that it was not appropriate to circumvent the complaints procedure in the manner suggested by the complainant. Trustees further considered that the handling of another individual’s complaint was not relevant to determining whether the complainant’s concerns raised a matter of substance. The complaint was made by Susan Dirgham, National Coordinator of Australians for Mussalaha (Reconciliation) in Syria on 2 July 2014 and raises a number of serious compliance issues in relation to ‘Saving Syria’s Children’. The complainant noted that a recent BBC programme had chosen to “selectively obscure” background “performances” which, when scrutinised in the original programme, “appear unconvincing to the point of risibility”. He also outlined his view that a recent edition of Newsnight contained footage which suggested there was “clear evidence of editorial chicanery”. Re: the first “programme” (just over a minute in length) referenced, see also footnote  here. Trustees noted that the complainant had not previously raised this allegation with the BBC and that they were not able to consider complaints about BBC content in the first instance, in accordance with paragraph 2.2 of the Complaints Framework and clause 90 of the Framework Agreement between the Secretary of State for Culture, Media and Sport and the BBC. The Committee noted that the complaints framework sets out that the complaints process “must be appropriate, proportionate and cost effective, balancing the interests of all licence fee payers with the rights of individual complainants and the BBC”. Trustees considered that it was appropriate, proportionate and cost effective for the editorial complaints and appeals procedure to set out rules that included time limits for raising a complaint regarding BBC content and rules that governed the submission of material from complainants. It was noted that the complainant had not submitted any evidence to suggest that the BBC Trust had breached the terms of the Royal Charter. The Committee noted that the complainant had raised other concerns relating to BBC content and the complaints process to support his substantive allegations. I am unclear which concerns are being referred to It did not consider that any of these additional issues qualified to proceed to appeal. Trustees considered that these ancillary matters did not raise a matter of substance and it was not appropriate, proportionate or cost effective to consider these issues, in light of the Committee’s conclusions regarding the substantive complaints. In relation to the main allegation that the Panorama team was complicit in fabricating footage of an incendiary bomb attack, Trustees wanted to emphasise that none of the substantive evidence provided by the complainant had been persuasive, and that any attempt to investigate his unsubstantiated claims that third parties might provide such evidence would incur further cost to the BBC which could not be justified. The Trust was concerned at the resources the BBC had already had to devote to defend itself against this complaint. The Editorial Standards Committee wanted to put on record that, on the basis of the credible evidence it had seen, it had no reason to doubt the authenticity of a programme which had played an important role in bringing home to UK audiences the realities of the civil war in Syria, and which could only have been made with the personal courage and commitment of the Panorama team. Since I positively identified victims “X” and “Y” as being present both in the BBC’s footage and the Demotix images (see my letter to the ECU of 7 May 2014) it has become apparent that all the footage and images were made on the same day and consequently I have not referred to the matter of the conflicting dates since 11 June 2014. However the varying responses on this matter provided by Ian Pannell and the Editorial Complaints Unit, as noted here, remain instructive. The Adviser noted the complainant’s allegation that a set of images taken by a freelance photographer had appeared on a third party website [Website name] which had originally suggested that the incident had happened a day earlier than was stated in the Panorama programme. The Adviser investigated the [Website], and noted that it currently shows the date of its images as 26 August 2013, i.e. the same date given by the Panorama team for the incident. The Adviser also noted that the Facebook page of the photographer who filmed the images had a posting dated 28 August in which the photographer said the incident happened two days earlier, i.e. 26 August. “I have already provided evidence that they were originally published dated 25 August; it is incumbent upon the BBC to provide proof this was not the date of their publication on [Website name]. Clearly this matter can only be settled by accessing the metadata of [the photographer]’s original photographs. The Adviser noted the only evidence for the earlier date for his images was from what the complainant said were screenshot captures of the [Website] which he had made in December 2013 and which were no longer available. The screengrabs have remained constantly available at the location which I sent by email to Colin Tregear of the Editorial Complaints Unit on 29 April 2014, also included in my letter to Mr Tregear of 7 May 2014 The Adviser also noted evidence supplied by the complainant, that he wrote on 16 December 2013 to [the Website] to inquire about the upload date and time of those images and that [the Website] had declined to respond on the matter. The Adviser did not consider there was any justification for a direct approach to [the Website] as suggested by the complainant as she did not consider the detail of a now corrected error which it is alleged appeared on a third party website was a legitimate matter for investigation in the context of this complaint. The Adviser took the view that, given the photographer’s Facebook posting, even if the complainant was right about the original date on the [Website], it could reasonably be concluded that [the Website] had simply posted the wrong incident date when the photographs were uploaded onto their site and, having been alerted to the error, had changed the images to reflect the correct date. Therefore, the Adviser considered that, were this allegation to proceed to appeal, it would not have a reasonable prospect of success and she did not propose to put it before Trustees. The Adviser noted the allegation that the Panorama programme was internally inconsistent in how it presented the date of the alleged attack: that according to one reference in the narrative it would have been 26 August, and to another it would have been 29 August. “In the course of the programme, the doctors were variously filmed in a refugee camp, delivering food aid to villages, visiting a frontline clinic run by [the charity featured on the programme] and treating victims of the attack on the school. The programme did not purport to present a neat, chronological timeline where every event shown followed the one that had been shown previously. On the both sides of the divide children are becoming orphans and refugees. The next morning we move to a village a few miles west of the frontline. It’s home to hundreds of families who’ve been uprooted. 11-year-old Wahda joins the scramble at the village well for dwindling resources. Bashar Assad orphaned these kids. There’s no-one to raise them now. He killed them. He destroyed our houses and burned them. The Adviser noted the complainant’s view that the section did not show children at a refugee camp but rather at the village well. The Adviser considered a less literal translation of a refugee camp than that understood by the complainant was necessary. The commentary made it clear that the children at the well were orphans and had been uprooted. Therefore while it may have been a village, the location now also served a wider purpose, as a temporary home (refugee camp) for those displaced in the conflict. The commentary made it clear that the newcomers – whose homes had been destroyed – were having to share scarce resources with the villagers. The Adviser considered the complainant had been given an adequate and credible explanation for what might at first have appeared to be an inconsistency in the timeline of the Panorama programme. She did not think that the way the programme had been presented was misleading in this regard. The Adviser concluded Trustees would be of the view that this allegation did not provide any reliable evidence to support the assertion that the timeline in the programme was misleading. The Adviser therefore did not consider this aspect of the complainant’s complaint had a reasonable prospect of success, and she did not propose to put it before Trustees. The Adviser noted the complainant’s allegation that photographs of the Panorama victims at a different hospital (published by [a third party website]) was evidence that the incident had been fabricated. My concerns surrounded the initial discrepancy in date between the Demotix images and the BBC’s account, and later the apparent discrepancy between the nighttime despatching of victims to Bab al-Hawa hospital, as seen in Panorama, and the Demotix images of their arrival in daylight, rather than the mere fact of the same victims being photographed at two different hospitals. Questions surrounding the movements of victims “X” and “Y” on 26 August remain. The Advisor noted that there had been some initial confusion in the correspondence about whether the [third party website] images were of the same victims as had appeared in the BBC coverage. 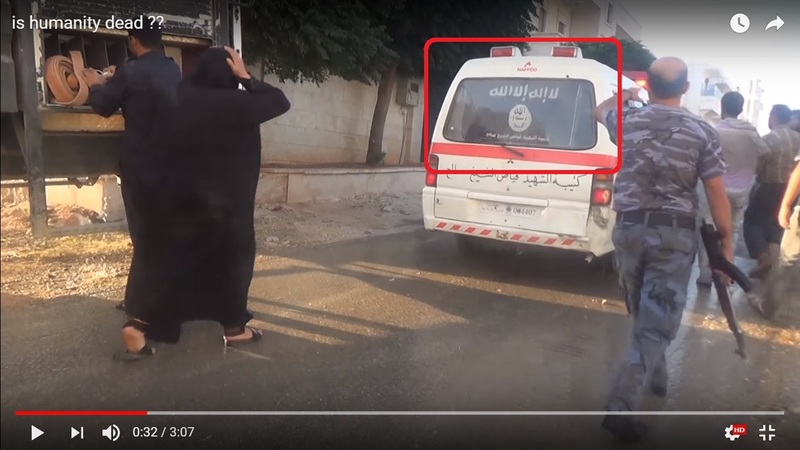 The Adviser noted the [third party website] images were taken at a different hospital, Bab al-Hawa, which may have been the reason the BBC team initially concluded they portrayed different victims. It remains surprising that the BBC team was unable to identify two of the victims it had spent several hours filming, one of whose injuries (Victim “X”) are shockingly distinctive, and both of whom had featured in contemporary UK media coverage of the alleged incident However, the Adviser observed that the hospital where the [third party website] pictures were taken was just two miles from the Turkish border, and that it was stated in the Panorama programme that some of the victims from the hospital where the Panorama team had been filming had been taken to Turkey for specialist treatment. As the incident happened close to a lightly-equipped frontline “field hospital” it would seem reasonable to conclude that the casualties may have stopped off at an intermediary hospital en route, such as Bab al-Hawa. Mr Tregear’s “study” was conducted and his “opinion” formed subsequent to the analysis of the “relevant material” which I had submitted to him on 7 May 2014 (see here). The Adviser therefore did not consider Trustees would be of the view that this allegation provided any reliable evidence to support the assertion that the incident had been fabricated. The Adviser did not consider this aspect of the complaint had a reasonable prospect of success, and she did not propose to put it before Trustees. The Adviser noted the complainant’s view that Panorama’s claim that the attack happened at 5.30pm was inconsistent with several of the images in [a third party website’s] pictures which were taken outdoors in daylight. However, the Adviser understood from the ECU investigation that there is daylight footage in the BBC rushes of hospital staff discussing the transfer of patients to hospitals in Turkey and shots of an ambulance waiting outside the hospital at the same time. The Adviser therefore concluded that Trustees would be of the view that the daytime images of victims were not inconsistent with the material filmed by the BBC, nor could they be regarded as evidence that the BBC material was faked. The Adviser concluded that were this allegation to proceed to appeal it would not have a reasonable prospect of success, and she did not propose to put it before Trustees. As noted above, questions surrounding the movements of victims “X” and “Y” on 26 August remain. The Adviser noted the complainant’s contention that a number of instances in which material was broadcast out of chronological sequence was evidence that the entire episode had been fabricated. the same victims were shown on more than one occasion out of chronological sequence, as evidenced by their dress and their behaviour Note sections Misleading and manipulative editing and Sequencing of events in Panorama. identical scenes were shot from different angles suggesting either two cameras or different “takes”, as in a film This refers to my questions regarding the two versions of Dr Hallam’s “interview”, first raised in the PS to my initial letter to the BBC. The discussion continued until 19 May 2014 (section 9) when the ECU finally appeared to understand the question I had been asking. The Adviser also noted the complainant’s view that the doctors’ movements during a 10 minute section of the Panorama programme were presented as a chronological sequence, but that the lack of continuity in times of day, clothing and locations suggested otherwise. There are very few recorded programmes that do not involve some intervention from the production team, but there are acceptable and unacceptable production techniques. Consideration should be given to the intention and effect of any intervention. It is normally acceptable to use techniques that augment content in a simple and straightforward way for example by improving clarity and flow or making content more engaging… It is usually unacceptable to use production techniques that materially mislead the audience about the reality of the narrative or events. inter-cut shots and sequences to suggest they were happening at the same time, if the resulting juxtaposition of material leads to a misleading impression of events. Commentary and editing must never be used to give the audience a materially misleading impression of events or a contribution. The Adviser noted that the BBC accepted the footage had been broadcast out of sequence on a number of occasions. However, the Adviser considered that this was justified by the chaotic scene that the programme was trying to capture. The Adviser was not of the opinion that the editing decisions in the programme had misled the audience. For this reason, the Adviser concluded that were this allegation to proceed to appeal it would not have a reasonable prospect of success, and she did not propose to put it before Trustees. The Adviser noted the complainant’s allegation that an audio edit of an interview with [a doctor] (who featured in the output), in which some of her words were edited out, was misleading. The Adviser observed that because the doctor was wearing a medical face mask throughout the interview the programme had been able to edit out some of her words without the audience being able to notice, because there was no need to resort to a “cut-away” edit shot to avoid a jump cut in the vision. The Adviser noted that the editing had resulted in only a very minor change to the image that appeared on the screen at the point a certain word was spoken, and that the programme team had chosen to make this change because [the doctor] referred to a “chemical weapon” when it was known by the time of broadcast that the bomb was an incendiary device. The Adviser considered that the change would have had no effect on the audience’s understanding of what was happening at the time, and she considered that the change was editorially justified. The Adviser believed Trustees would be likely to agree that there was no evidence that the editorial decision to edit the audio of the doctor in the way it had was likely to have resulted in viewers being misled and she therefore decided that the allegation would not have a reasonable prospect of success were it to proceed to appeal. She did not propose to put it before Trustees. This refers again to the Dr Hallam “interview”, raised in the PS to my initial letter to the BBC. The BBC’s explanation for the audio editing is in its letter of 2 December 2013 and discussion on the number of takes and the precise point at which the doctor’s words were spoken continued until 19 May 2014 (section 9). In fact, at the point in time at which the Adviser’s comments in this Annex (taken from her 8 August 2014 decision) were made, I do not believe I had explicitly claimed that the audio edit was misleading, although I later did so in my final submission of 13 October 2014. The Adviser noted the complainant’s allegation that in an interview given by one of the British doctors to [a radio programme] in Australia three months after the incident she suggested that the first victim to arrive at the hospital was a boy who was covered in “strange white dust”, and that this contradicted information in the Panorama programme. The Adviser noted that in Panorama, and by the complainant’s acknowledgement “in several other accounts”, the first victim was a baby. The Adviser was of the view that one inconsistency between the Panorama programme and an interview of unknown accuracy, given on a different network, after the event, did not raise sufficient evidence that the BBC content was not duly accurate. The Adviser concluded that Trustees would be likely to be of the view that this allegation also did not provide any reliable evidence that BBC output was inaccurate or misleading. the baby’s father seemed entirely unscathed but a BBC News report described him as “also burnt … sat helplessly on a stretcher clutching his son”; [a doctor] described him as having had a burnt face. injuries to the hands of two of the victims had the appearance in both cases of a prosthesis. Contrary to the suggestion that victims had not suffered damage to their eyebrows, the reporter had related to BBC Complaints that he could smell burnt hair and flesh and there were ashes on the hospital beds from the hair of some of the victims, but on other victims their eyebrows were not burnt. The Adviser was of the view the complainant had not raised sufficient evidence to support his allegation that the footage broadcast by Panorama had been fabricated. The Adviser noted the complainant’s allegation that there was a lack of clarity across the media as to the numbers injured. The complainant asserted that most reports had put the number of fatalities as between eight and ten students or children, but that it was not clear, across the media, whether these were of people who had died at the scene, or later as a result of their injuries. The complainant also referred to quotes from [a doctor] (one of the two doctors filmed by Panorama) in third party media, in which she gave slightly different figures to those in Panorama itself. The Adviser noted the guideline on Accuracy requires that BBC output is well sourced, based on sound evidence, thoroughly tested and presented in clear, precise language. The Adviser noted the team had witnessed for themselves the immediate aftermath of the event, had seen some of the fatalities with their own eyes and had followed their initial visit up with a subsequent visit to Turkey to try to ascertain what had happened to some of those who had been injured. At least one of those victims, [name], who was alive at the time of that visit, according to information in the correspondence for this complaint, subsequently died. She would not have been one of the ten included in the figure of fatalities in the commentary in the Panorama programme. The Adviser noted too that the BBC did not suggest a number in its output of those injured overall, and that the fatalities noted were those known to the team at the time the Panorama programme was broadcast. The Adviser considered there was nothing to suggest the way in which the programme and related BBC output had reflected the casualty figure was not duly accurate, based on what was known at the time. The Adviser therefore concluded that were this allegation to proceed to appeal it would not have a reasonable prospect of success. The Adviser considered that the BBC had explained why the school in the programme appeared to be a private home, and did not consider the complainant had provided evidence to support his contrary assertion. The interior of the premises can be viewed in two videos, here and here, which were brought to my attention some time after 14 June 2014 (the date upon which I was contacted by the Dutch woman, who appears at 20:36 in the first video). “Two different women at the [charity] hospital are filmed wearing the same black dress with the distinctive gold flower pattern, and seemingly also the same blue headscarf. “The older woman is seen rushing through the hospital gate at around 36 minutes in Panorama with a man claiming to be her father (they in fact appear of similar age) and proceeds to engage in a bizarre combination of mournfulness and angry ranting. In the very next scene, in what the BBC has stated is chronologically earlier footage, she is seen being transported by stretcher from an ambulance into the hospital. “The younger woman is featured from 0:17 in this [broadcaster’s] video [a link was attached] where her words are translated “…all I saw was people on fire, I was on fire, my friends were on fire”, presumably indicating that she is intended to represent a student at the alleged school. The younger woman also appears in the longer of the two You Tube videos you cite, from 01:35 to 01:52, 02:16 to 2:20 and 04:35 to 04:40. The Adviser therefore considered the allegation she should consider was whether the same clothes had been worn by two amateur actors, and whether this was evidence that the events shown in the Panorama programme had been fabricated. The Independent Editorial Adviser viewed the relevant sequences in the Panorama programme and also the YouTube footage, and reported her findings to the Adviser. Whilst the Adviser was of the view that the third party footage from [a broadcaster] was not relevant to her consideration of the allegation that BBC output was inaccurate, having viewed the material on YouTube, she understood that it was clearly the same individual who appeared in all three sequences, contrary to the complainant’s assertion in his letter of appeal. Therefore neither the third party footage nor the sequences which appeared in the Panorama programme offered any evidence to support the assertion that there were two female actors who had swopped costumes and that this was evidence that the incident had been fabricated. The Adviser therefore concluded that this allegation would be unlikely to succeed should it proceed to appeal. See here. On the Adviser’s view that “it was clearly the same individual who appeared in all three sequences” see the further analysis provided in this 29 December 2014 appeal to the BBC Trust. (Update 2018: as noted above I now acknowledge that there was only one “black dress woman”). The Adviser also noted the complainant’s allegation that [the doctor’s] father had links to the Syrian opposition. He pointed to an article written by [name] in February 2013 that states that [the doctor’s] father is “involved politically with the Syrian National Council”. “I think it was implicit that the charity was working in an area of Syria controlled by the opposition and would therefore be likely to share its aims and objectives (as opposed to supporting the Syrian government). “[doctor’s] family is from Syria and she lived here as a child.” – this neutral statement gives no indication of Dr Hallam’s allegiances. It could be said equally of someone who supports the Syrian government and someone who supports the opposition. “By travelling with the doctors I’m hoping to see the humanitarian crisis through their eyes – but we can only film their work in rebel held areas.” – again this is not an explicit statement that Drs Hallam, Ahsan, or those filmed working at the Hand in Hand hospital are opposition supporters, much less that Hand in Hand for Syria itself is firmly allied with the militarised Syrian opposition. [The doctor] referred to Syria in the possessive: – as might someone on either side of the political divide. “…the last couple of years the focus has been so much on trauma and war injuries that actually everything else had gotten forgotten. And now, we found ourselves like two and a half years down the road, our whole healthcare system has essentially been destroyed.” – the “we” and “our” seem most naturally to refer to the Syrian nation state (especially “our whole healthcare system”) and so if anything would suggest loyalty to the Assad government. The regretful reference to the trauma and suffering of the last couple of years does not indicate any partisanship. The above notes on these bullet points are taken from this 29 December 2014 appeal to the BBC Trust. On the both sides of the divide children are becoming orphans and refugees. The Adviser considered that no evidence had been produced that [the doctor] had either formal or informal links to the Syrian opposition. The Adviser considered the audience had been accurately informed that [the doctor] was of Syrian extraction and agreed that viewers would have been able to judge for themselves on the basis of [the doctor’s] contributions in the programme, where her loyalties might lie. Contrary to the complainant’s contention, the Adviser was not aware of any information that had been withheld from the viewer which required to be included. The Adviser considered also whether there was any evidence to support the complainant’s implicit allegation that the [charity featured on the programme] was formally linked to the Syrian Opposition, such that the programme was obliged to mention the fact in order to achieve due accuracy and due impartiality. The fact that the charity was founded by members of the Syrian diaspora did not, in the Adviser’s view, provide any information to support the allegation. Note this investigation into the financial affairs and political affiliations of Hand in Hand for Syria by Dr Declan Hayes of the University of Southampton (a brief update on Hand in Hand’s accounts is here). Dr Hayes’ research has been submitted to the police and the Charity Commission. The Adviser also thought it likely Trustees would agree with her that, regardless of whether [the doctor’s] father had any links to the Syrian opposition or not, his political allegiances were not a relevant consideration in deciding whether facts were presented accurately in the programme. The Adviser was of the view that the programme had referred to [the doctor’s] beliefs and those of the [charity] in a duly accurate manner in the programme, and she saw no evidence to suggest that the audience had been misled in that regard. The Adviser therefore concluded that there would be no reasonable prospect of success were this allegation to proceed to appeal. For all the reasons above, the Adviser concluded that were this complaint to proceed to appeal, Trustees would not be likely to conclude that the events presented had been fabricated. She therefore did not consider the appeal had a realistic prospect of success and did not propose to put it before Trustees. No surprise here then. Only compliments are registered. What an in depth expose you have done here. Others may well be interested. Wow, you wasted a lot of people’s time by complaining about the coverage of what was an awful war crime. The BBC has comprehensively shredded everyone of your shameful quibbles. I honestly and sincerely don’t know how you sleep at night. And you have the nerve to post this at medialens which is an organisation that claims to promote compassion. You, Sir, are the scum of the earth. So the BBC finds itself not guilty of fabricating propaganda. What a big surprise. Please continue fighting this important fight, and thank you. A disgraceful decision. But that’s the BBC for you.